There are a lot of stain removing hacks out there, like removing stains from kitchenware, carpets, etc. But the ones we seem to need the most are clothing stain removal tips. We wear clothing everyday, so it’s no wonder that they’re at bigger risk for attracting makeup, food, or even sweat stains. And let’s be honest, not all of us have the money to buy a new wardrobe – or maybe you really like certain articles of clothing. We have to make due with what we’ve got, so why not find a few hacks to keep our clothing looking like new? 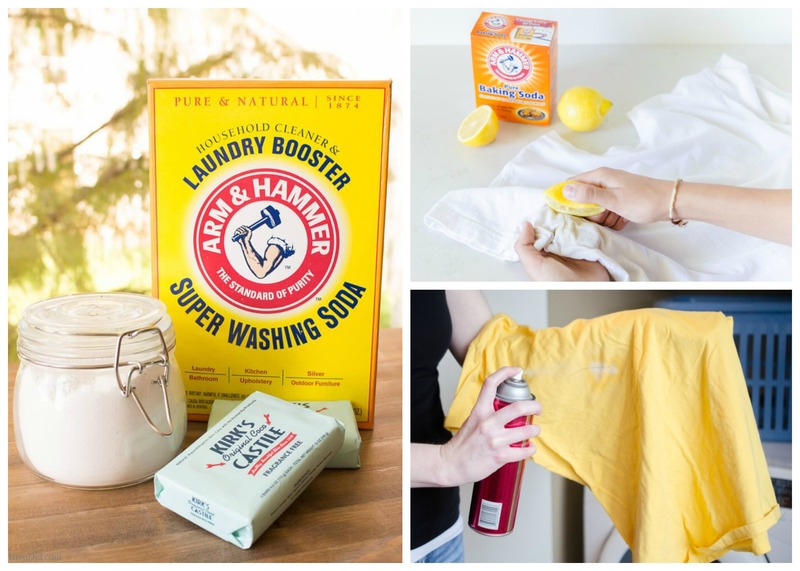 Down below I found some awesome stain removing tips and tricks done by awesome bloggers. So check them out and let me know what you think! Grease stains can be a pain to get out. So try putting some Coca-Cola in your regular wash to get them out. Now if you like creating your own chemical free cheap and easy cleaning products, then definitely try this DIY recipe out! You can easily find the Super Washing Soda here and the Kirk’s Castile here ! Whether it’s freshly squeezed lemon juice or lemon concentrate, both will help get armpit stains out. But if you have a tougher stain, then create a mixture/paste of baking soda and water, and let it sit for an hour before washing. You can get baking soda here ! You can save yourself some time and find Dawn here and hydrogen peroxide here! I hate getting makeup stains on my clothing, which is why i really love this hack for getting them out! You can get shaving cream here! If deodorant stains are showing up on your dark clothing (seriously a pain), then try rubbing it away with dryer sheets! You can get dryer sheets here! Now if you have lipstick stains, then try getting it off with hairspray. Just spray it, let it sit for a few minutes, dab it away, and wash.
You can get hairspray here . Before washing, pour some white vinegar onto a coffee or tea stain so that your favorite white blouse doesn’t show signs of your caffeine addiction (just kidding!). You can find white vinegar here! If your shoes/boots are starting to show water stains, then try rubbing it down with white vinegar and a toothbrush! I LOVE this hack. There have been times where this stain removing tip has saved an outfit. Works like a charm, just make sure you keep on applying and rubbing it off with a cloth until done. We all hate getting our favorite top or bottoms stained. That just means we’ll have to throw it away, or it’s just automatically become an “around the house” outfit. But hey, with a few hacks and tips like these, you can save yourself some time and money and keep those clothing pieces around longer! Now if you have any question about these clothing stain removing tips and hacks, just let me know in the comment down below! I’d love to help you out!